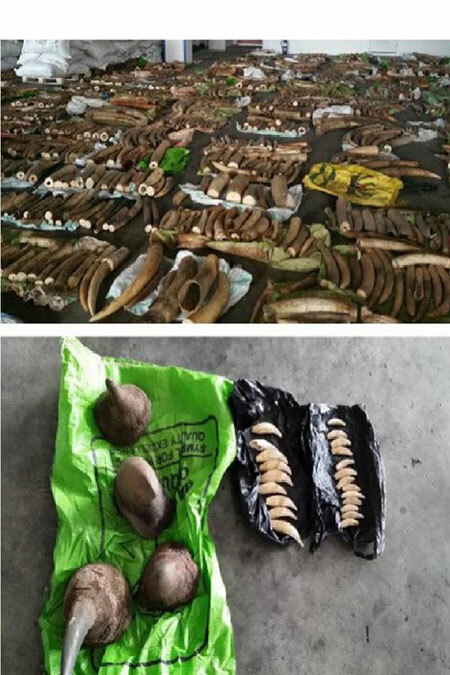 VietNamNet Bridge – Singapore authorities have seized nearly 2,000 pieces of ivory tusks and four rhino horns from shipping containers from Kenya on their way to Vietnam. It is the second largest seizure of illegal ivory in Singapore since 2002. Agri-Food & Veterinary Authority of Singapore (AVA) with the support of Singapore Customs and the Immigration & Checkpoints Authority acted on May 20 from a tip-off to intercept the illegal haul weighing 3.7 tons valued at US$8 million. The shipment, which was declared as tea leaves, was shipped in two 20-foot containers from Kenya and was transiting through Singapore for Vietnam. “The Singapore Government has zero tolerance on the use of Singapore as a conduit to smuggle endangered species and their parts and products,” said Ms Lye Fong Keng, Deputy Director of AVA’s Quarantine & Inspection Group, Wildlife Section. The maximum penalty for the illegal wildlife is a fine of US$50,000 per scheduled specimen (not exceeding US$500,000) and/or imprisonment of up to two years. “The illegal trade of endangered animal parts is fuelled by increasing demand and poaching. Tackling the illegal wildlife trade requires concerted efforts by the international community,” Ms Lye Fong Keng said. The animal parts, which also include 22 canine teeth believed to be from African big cats, will be held AVA for further investigations. Each piece was concealed among tea leaves. In April 2014, AVA and Singapore Customs intercepted a shipment of illegal ivory, estimated to be worth US$2 million. The container was declared to be carrying coffee beans. Under the Convention on International Trade in Endangered Species of Wild Fauna and Flora (CITES), to which Singapore is a signatory, elephants, rhinoceros and big cats (e.g. leopards and cheetahs) are endangered species. International trade in ivory, rhinoceros horns and certain species of big cats’ teeth are banned under the Convention. Anyone with information on illegal wildlife trade can contact AVA through the feedback form on AVA’s website (www.ava.gov.sg).